Back in college I actually did like to cook once I was living in an apartment and the sorority house. But even though I'd make something like a roasted or sautéed chicken breast, I'd still use instant sides (hey it was college - just making the chicken is pretty impressive). One of my favorites was the Uncle Ben's rice packet that had the seasoning and veggies all mixed in, specifically the broccoli cheddar one. It was easy, didn't take much time, and when it was done you had a creamy, cheesy side that was both your starch and veg. Nevermind the fact that it had more sodium that any person should eat in a week - I didn't care about that stuff back then. 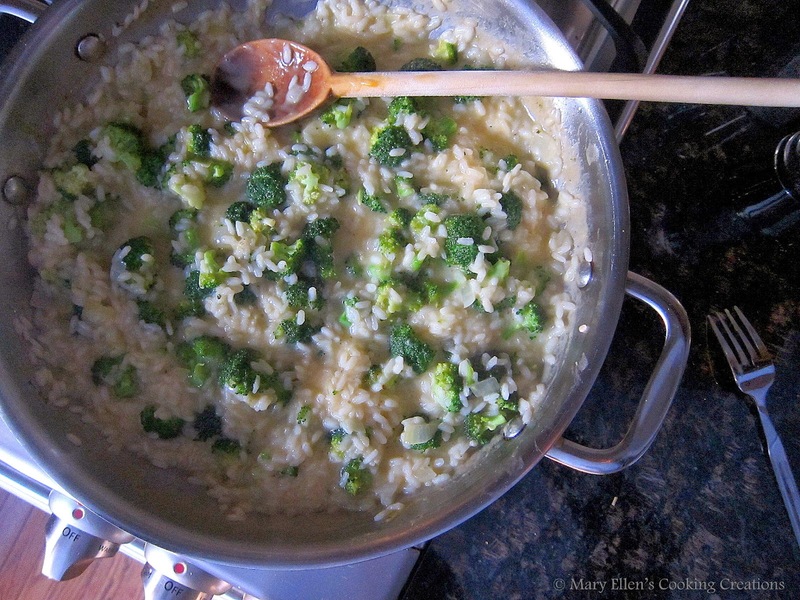 Well when I saw this recipe pop up in my Feedly app, I instantly thought of those college days and was immediately craving cheesy rice with broccoli. My favorite college dinner turned into a homemade, grown-up risotto - yes, please! Risotto is one of my favorite things to cook and eat. 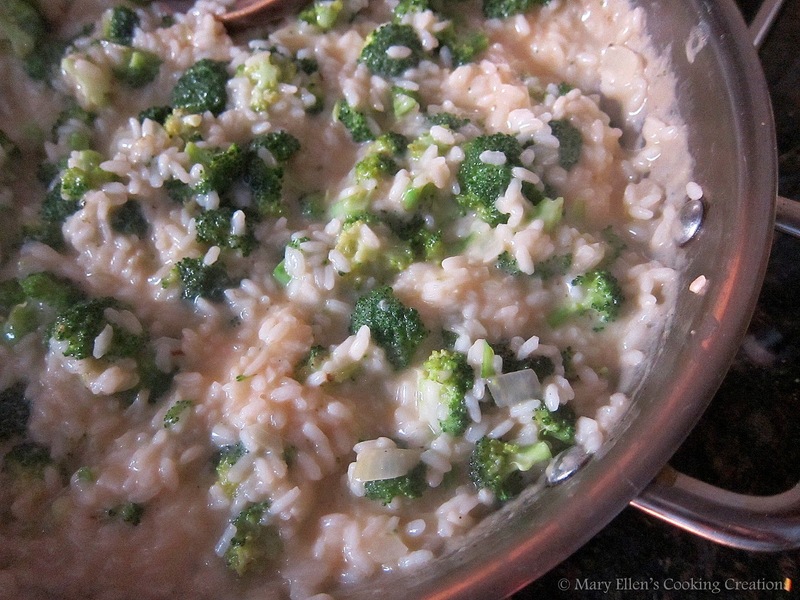 I love this creamy rice dish so much that I created a page in my recipe index dedicated solely to risotto. Take a look - there are more than 20 risotto recipes ranging from simple parmesan-garlic and mushroom recipes to black truffle risotto and even some really interesting ones like Mexican risotto and Asian-inspired risotto. I'm so thankful that my friend Sarah found this recipe, made it, and posted it on her blog A Taste of Home Cooking because honestly, while I have experimented with many ingredients when making risotto I never thought of using broccoli and cheddar. But it works - it totally works. Bring the chicken broth to a low simmer in a saucepan. Keep warm. Heat 1 tablespoon of the olive oil in a large saute pan over medium-high heat. Add the broccoli and season with salt and pepper. Saute approximately 10 minutes until the broccoli is tender and browning in spots. Remove the broccoli from the pan. Melt 1 tablespoon oil and 1 tablespoon butter in the pan over medium-high heat. Add the onion; sauté 2 minutes. Add the wine and stir until evaporated, about 1 minute. Start adding the chicken broth one ladle-full at a time, letting it fully absorb before adding more. This process takes anywhere from 17-25 minutes - near the end keep tasting your rice to see if it is cooked through. Before you add the final ladle of broth, add the broccoli back in. Add the final ladle of broth and once it's just about absorbed, turn off the heat and add the grated cheese. Adjust seasoning, if necessary. Yay! So glad you made this and that you liked it. I need to make it again. It was SO delicious. I really want to add shrimp, or maybe chicken, next time to make it a one-pot meal.